Bacalhau, is a Portuguese dried, salted codfish widely used in Portuguese cuisine, also known as dry, salt-cured cod or salt-fish in other parts of the world. Before refrigeration, codfish was dried and preserved in salt to keep in the cellar. For a perfect pairing it's important to serve with the delicious Almeida’s Onion & Garlic Sauce. Bacalhau (Salted Codfish) needs to be soaked overnight (or for at least 10 hours) in several changes (at least once) of fresh water to get rid of some of its salt. It’s a step that can’t be skipped or the fish will be way too salty. Drain the bacalhau, rinse with fresh water. Cut into small pieces. Peel the potatoes, then cut them into 1 inch squares. This Peeler is a time saver. Place the potatoes and bacalhau in a large straight-sided pot with clean boiled water. Cook for about 10-15 minutes or until potatoes are almost cooked. 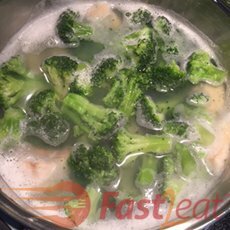 Add the broccoli florets and cook for more 4-5 minutes. While bacalhau is cooking scald the sliced onion twice. Just throw boiled water on it, leave 5 minutes, drain, rinse with cold water, drain and repeat the process. Use this Egg Slicer Tool to slice the boiled eggs. Drain the bacalhau, potatoes and broccoli florets and place them in a large bowl. Mix the scalded onion, peas, parsley and olives and cover with sliced boiled eggs. Serve with the delicious Almeida’s Sauce. Tip: 1 boneless skinless codfish is about 500g -1Kg. The thickest ones are tastier.